At the Digital Media and Learning (DML) 2012 Conference in San Francisco this past week, during a panel discussion on investment in education innovation in which promises of large amounts of funding for schools were being dangled as carrots to an all-too-fawning audience, Rudy Blanco came to the microphone to ask representatives of the Gates and MacArthur Foundations why his poor school in Bronx doesn't seem to be able to get any of the millions being discussed. The answers he got were a largely uninspired description of how organizational decisions are made, and I don't think they felt any more satisfactory to those giving them than to Rudy or to those I spent the rest of the day talking to about this moment. Rudy became our focus for trying to understand a more general discomfort with what we were seeing and hearing at the conference, and the day ended with my own coming to a significant realization: two very different conceptions of technology-driven education reform were being conflated into one larger story, and if I'm right, it's very important that we break them apart. 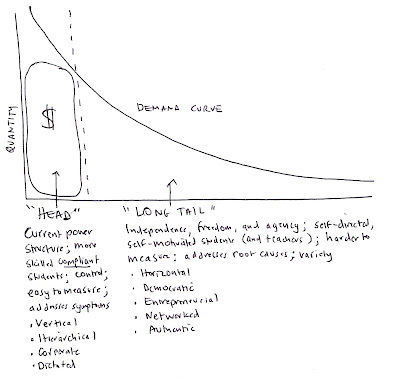 The Long Tail, as popularized by Chris Anderson, is a graphical description of a shifting world in which previously only those products or services which sold in high enough quantity (the high end, or "head" of the curve) were carried in physical stores, as their sales justified the combined manufacturing, marketing, distribution, and warehousing costs. The products or services in the "long tail" of the curve, sharply demarcated at the point at which they were not popular enough to make it to the physical stores, for the most part just didn't used to get distributed or sold. The Internet has significantly changed marketplaces that reflect this curve of demand, and it is believed that Amazon may sell more product in aggregate in the "tail" than in the "head"--meaning they sell more books in total that don't make it to the remaining traditional bookstores than do. What I came to realize last week is that what Rudy from the Bronx really wanted was appreciation. Because of the way the conference and its sponsors defined support as financial, he rightly felt unappreciated. But I think what Rudy, and most educators, really want is the kind of support that has nothing to do with money. It's the kind of support that the network now brings, the collegial support of those working hard to make a difference in the lives of children, and the money is a red herring. Ed tech reform in the head is about using money to scale simplified solutions of that which is popular, or the status quo. 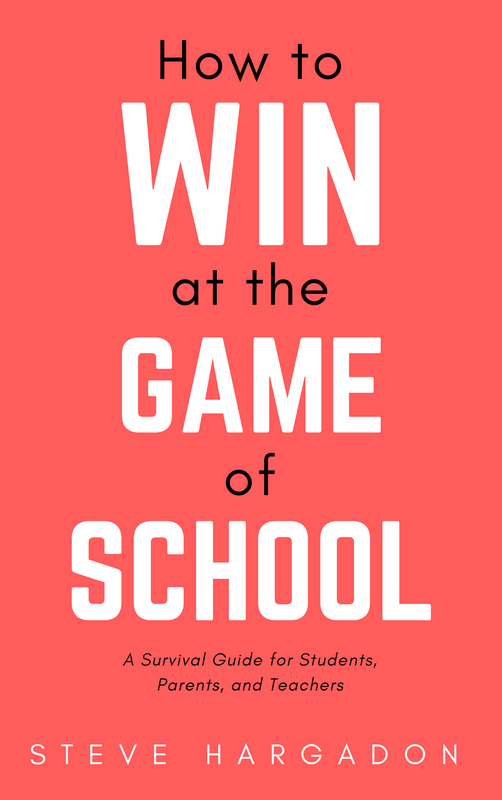 Ed tech reform in the tail is about using the network to provide freedom and choice. Ed tech reform in the head is like a diet pill, addressing the symptoms, whereas ed tech reform in the tail is like learning to eat healthfully, addressing the cause. The diet pill is easy, learning to grow and eat healthy food is much harder. Or: vertical ed tech reform based on money is like the scaled food at McDonalds, whereas horizontal ed tech reform based on diversity is like the wonderful variety of restaurants in a city like San Francisco. Let's go even further. If more books are being sold in the tail than at the head, we might argue that it's likely that more jobs in the future will be in the tail as well--that is, entrepreneurial jobs, not corporate ones. This is actually quite stunning if you think about it. The skill-set we often say that we want for students--for them to become self-driven, passionate, independent learners--very much fits the job demands of an entrepreneurial work world. But it occurred to me last week to me that this kind of true independence of mind and of spirit is not really likely to be valued in corporate jobs, since they depend on workers assuming and complying with a corporate culture and viewpoint. In fact, if we were to describe what the corporate world is saying it needs right now, the basic message is for more skilled, compliant students. Students who do better on the standardized tests, but who don't revolt against the standardized test as a measure or pathway to successful lives. Those organizations with the big money to hand out live in this world of organized, compliant, corporate values. The people that work in those organizations gain power and influence within them by following that model. And their definitions of educational success aren't likely to be the kind of self-empowerment that, say, a Big Picture Learning school provides. I know this sound awfully dramatic. I don't know if that's just me, or if it's actually because the divide between these two messages of education reform are as different as they seem right now to me to be. 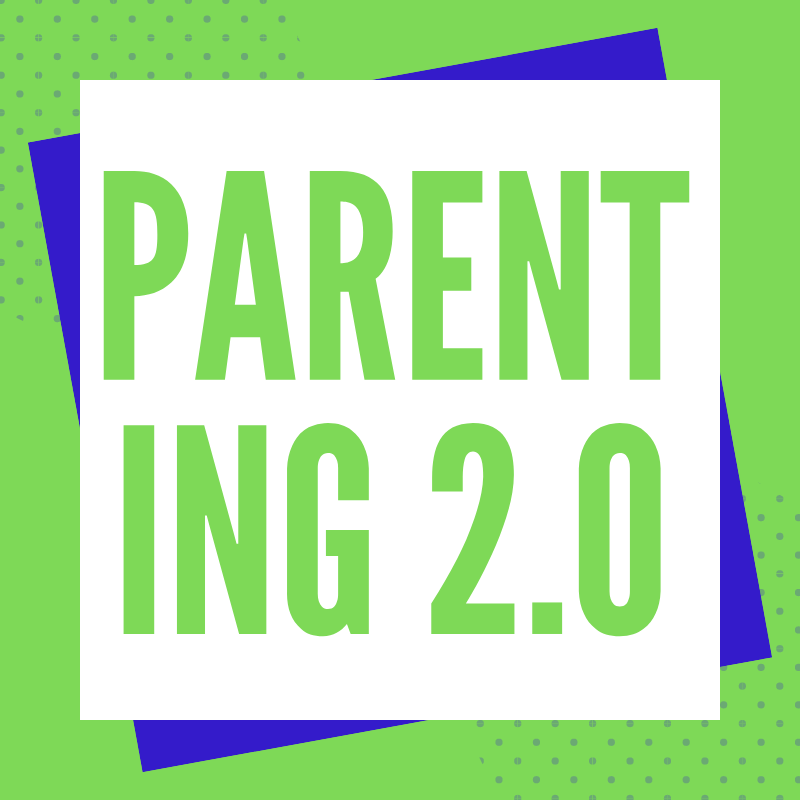 But if I'm right, then those of us who really care about teaching and learning as ways of helping to liberate the passion and independence of learners are going to have to both recognize--and figure out how to avoid--the hidden compliance agendas of the big money being doled out. And also how to make sure we're building the kind of appreciative support networks that will help the Rudys of the world. How much do I love this article and Steve's sentiments? What do they mean to my organization? Thanks Steve! I think the first thing to do is to be honest about this. 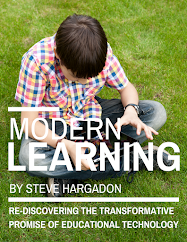 We're talking about trying to get kids to think differently. In a world that prizes conformity--or, at best, creativity within a narrow set of boundaries--we're setting them up for struggle. Kids who mostly do what they're told are going to have an easier time getting through school, getting a job and making a life. This is not news. But we talk about how we want creative thinkers and we promote teaching that supports creative thinking without mentioning the downside. Eventually, the creatives are going to find out anyway. But I wonder what would happen if we did a better job of preparing them for the struggle. @Lisa--love it that you loved it. 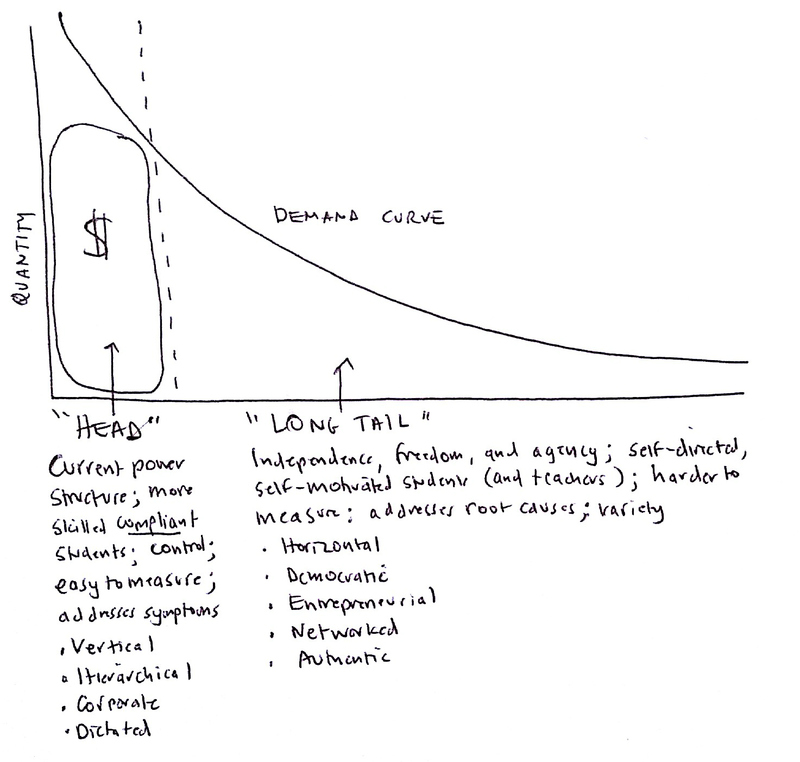 Excellent summary of Anderson's Long Tail and a convincing application to educational reform. I think it can be a bit dangerous to create a dichotomy, however, since this can end up demonizing some of those vertical players that are trying to evolve. I've seen this in the Open Access movement. It's easy to condemn big players like Elsevier, but when Sage and Oxford come out with hybrid open access arrangements, it's a victory and not a defeat for OA. On the other hand, the utility of your division is to identify opposing motives (money vs. passion) which do in fact create overlapping but distinct attention and actual economies. How do you see the emerging alternate credentialing system (badges) playing into this? I think it provides a fertile middle ground between horizontal and vertical. @m2teach You're going to have to help me to understand better the hearts we have won...? Absolutely superb post, Steve. I'll be thinking about this one for a long while. Thank you! This is easily my favorite post on this topic in recent history. I had a similar throw-down with MacAruthur at the Games, Learning, and Society Conference (itself a symbol of what you are talking about) back in 2008. Now, let us all scream this sentiment from the roof-tops. As an armchair economist, I love being able to see these concepts being woven into the edtech/ed reform debate. Keep up the good work Steve, and I enjoyed your session at SXSWedu! Great post Steve! 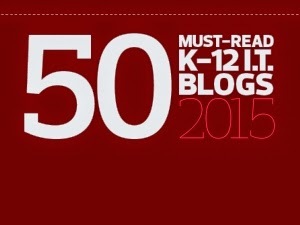 I highlighted it on my blog and would love to chat with you sometime about building the educator/edtech community. Check out the event I'm hosting in a couple weeks. This has been on my mind a lot lately. I work at a "21st century learning" magnet school that is high on tech, which of course, I love. But I'm often left wondering whose interests we're serving when admin aligns with certain programs, initiatives, and partnerships. Maybe we should start using code to distinguish between the two. One can be the "head-bangers" (in reference to your model), while those of us more on the grassroots side can call ourselves "tail-blazers"!